This book explores the basic principles of economic geography concerning location and spatial interaction. It addresses the economic geography involved in making both public and private location decisions and examines a variety of issues of general public concern. This text introduces the basic principles of economic geography concerning location and spatial interaction. Designed to bridge the gap between theory and application to the real world, it provides practical information on one of the most important courses of study in the modern curriculum. It explores the political, historical, and environmental contexts in which decisions are made. A selection of cases illustrates the applicability of economic geography. 3. 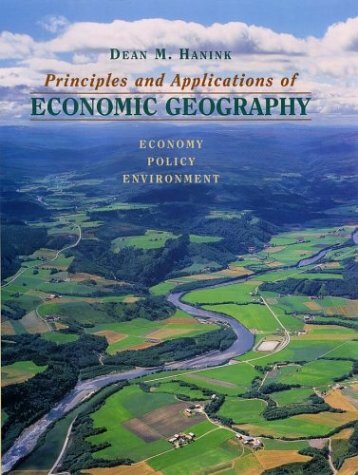 Principles and Applications of Economic Geography: Economy, Policy, Environment Hanink, Dean M.
4. Principles and Applications of Economic Geography: Economy, Policy, Environment Hanink, Dean M.
6. Principles and Applications of Economic Geography: Economy, Policy, Environment Hanink, Dean M.
Principles and Applications of Economic Geography: Economy, Policy, Environment Hanink, Dean M.